GenScript Biotech Corp. (HK Stock: 01548) is the world leader in biotechnology reagent service industry. Established in 2002 in New Jersey, United States, the company was the first to commercialize gene synthesis and successfully establish fully integrated capabilities for custom peptide synthesis, protein expression and engineering, custom antibody development and engineering, animal model development, in vitro/in vivo pharmacology as well as a variety of catalogue products, industrial enzymes and microbial reagents. After almost two decades of fast growth in developing biological reagents, the company has expanded its business into immunotherapy, CDMO, laboratory equipment, and microbial industry to further fulfill its mission in making people and nature healthier through biotechnology. For example, GenScript’s subsidiary company, Nanjing Legend Biotech, has accumulated a series of pipelines for immunotherapy, of which the leading CAR-T product (LCAR-B38M for multiple myeloma) has received IND clearance from both FDA and CFDA. GenScript has also established open and innovative technology-driven platforms and GMP facilities for pre-clinical drugs discovery and pharmaceutical products development along with a completed industrial microbial research, development and industrialization platform for enzyme screening, genetic engineering, protein engineering, and fermentation process optimization and research application. Headquartered in Nanjing, China, GenScript has R&D, production and operation centers in both Nanjing, China and New Jersey, U.S. manufacturing bases in Zhenjiang and Jinan, China, and operation branches in Ireland, Netherland and Japan. To leverage its technology advantage in enzyme engineering and boost synthetic biology applications in microbial industry, GenScript has recently established a biocatalysis research institute in Shanghai. With these facilities, GenScript has been serving more than 200,000 customers in 100+ countries around the world for more than 16 years. Since the first day, GenScript believed that "human and science engines" were the driving forces of its business. That is why among its 2600+ employees, by now there are more than 800 with master’s or Ph.D. degrees. This percentage is even higher than 90% in R&D and commercial teams. These powerful engines have enabled GenScript to develop and use the latest discoveries and technologies for establishing its fully integrated platforms towards generating industry-leading, highly customizable reagents for diverse applications. With outstanding products and quality services, excellent reputation, and a comprehensive portfolio of patents and trade secrets in synthetic biology, chemicals synthesis, protein and antibody engineering, immunotherapy and bioinformatics, GenScript has created a leading edge in the industry as well as close relationships with investors, such as KPCB, Shipston Group, China Resources and BALLOCH. Moving strongly into the future, GenScript continues to strive for its vision as the most reliable biotech company in the world to make people and nature healthier. Publicly-Traded Company: Listed in Hong Kong’s stock market (01548.HK) since 2015, GenScript has over 2,000 employees comprised of 28% Ph.D. & Master scientists who share their knowledge and expertise with our research partners worldwide. 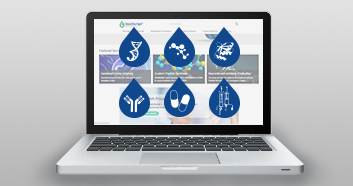 Frequently-Cited in Publications: With an average citation of 4,180/year, the number of peer-reviewed publications citing GenScript’s services and products has passed 26,900 over the 15-years of its tenure; placing GenScript among the most frequently-cited biotech companies in the world. Proven Gene Expertise: As the leading gene synthesis provider in the world, our gene synthesis tools are designed to make research accessible. Our propriety, PSO-based OptimumGene™ codon optimization technology enables the design of the most expression-efficient sequence available, while our CloneArk™ system provides a platform for researchers to archive, share and reuse their clones for future use with peace of mind. Reliable Synthetic Peptides: Powered by advanced PepPower™ synthesis technology platform and supported by stringent quality management systems, GenScript synthesizes more than 10,000 peptides/month with batch-to batch consistency, variety of custom modifications and delivery options while maintaining the record synthetic peptide length of 100 amino acids. Proprietary MonoRab™ Antibody: Through a combination of novel mouse-rabbit hybridoma technology and capability for early stage antibody sequencing, GenScript exclusively generates custom rabbit monoclonal antibodies with high sensitivity, affinity and specificity tailored for anti-idiotype and in vitro diagnostic antibody development. Premier High-Throughput Gene to Antibody Production: Designed to accelerate the drug screening process, GenScript helps researchers identify promising candidate leads and advance to the production of purified recombinant antibodies with one of the fastest turnaround times in the industry. Licensed CRISPR/Cas9 Genome Editing: Through partnership with the technology’s pioneering Feng Zhang's laboratory at the Broad Institute of MIT and Harvard, GenScript offers a variety of CRISPR services, including guide RNA design tools, pre-validated CRISPR plasmids, and learning resources to help scientists harness the power of CRISPR genome editing in life science research.